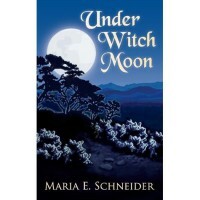 Maria Schneider's urban fantasy novel, Under Witch Moon, is one of those rare, wonderful books that transports the reader into an entirely different reality. Adriel knows that being a witch is hard. It's not only the difficulty in finding just the right spell for just the right job, it's also the troubling clientele. The humans demand perfection, the weres are hunting for a good time, and don't even get her started on the vamps. Add a smoking-hot man, a murder mystery, and a truly evil witch into the mixture, and it's no wonder why being a witch is nothing but trouble. One of the biggest reasons I enjoyed this story so much is that the author makes magic appear so realistic. After reading the book, I swear that I could work magic providing I had the right herbs and enough silver. The supernatural beings are also very real, especially the weres. Their human sides take on some of their animal characteristics, and their animals sides are, well, very animal. After dealing with idealized versions of these creatures in other stories, it was a relief to read something so grounded. I also loved the southwest setting. Having visited Sante Fe, NM, myself a few years ago, I could really relate to the book. But even if I had never been to the American southwest, the author describes the places so wonderfully that the reader would feel as if she's been there before. The mix of Hispanic, Native American, and Anglo-American characters was also a nice reprieve from the typical vanilla cast in so many urban fantasy novels. The book centers on a mystery, and it was that mystery that kept me turning the pages. There aren't any detailed subplots, but there are enough distinct threads running through the story to give it depth and make it interesting. One thing that I wanted to read more of, however, was the interplay between characters. I love reading about emotional entanglements, and while there was some of this, I wanted more. Adriel, a rather paranoid young lady, has maternal feelings towards a stray teen named Lynx, and mixed feelings for her yuppie sister. I found these relationships very interesting and wanted to read more about them. Also, at times, the descriptions of the magic become too detailed so that the world-building overshadowed what I would consider the more interesting parts of the story. Overall, Under Witch Moon, is a fun urban fantasy populated with interesting characters.